PDF of the entire issue (5.51 Mb). (pages 2-3): A major anniversary is a natural time to pause for reflection. This year, as TWAS celebrates it 30th anniversary, we are constantly aware of how the vision and hard work of Abdus Salam, the founding members and hundreds of other TWAS leaders and friends have made our Academy a force for global science. At the same time, we are renewing our commitment, setting our goals and charting a course into the future. 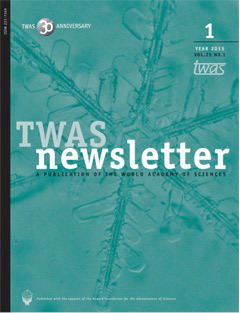 (pages 4-12): Early in his term, the new TWAS president details the Academy’s role in promoting science for sustainability in a changing world. (pages 13-15): After a series of new agreements with the Chinese Academy of Sciences and other partners, TWAS has more than doubled its PhD fellowships for study in seven countries. (pages 16-20): Top science leaders meet ing along the Danube explored how the scientists of Central Europe and the Northern Mediterranean could renew old bonds to address regional challenges. (pages 21-23): Crystallography reveals the sublime beauty of nature, and it drives innovation in fields from mining to agriculture and health. Today, it is critically important for scientific progress in the developing world. (pages 24-26): The Elsevier Foundation, the Organization for Women in Science for the Developing World and TWAS honour five early-career women researchers for work that can save lives and inspire a new generation. (pages 27-31): The global network of science academies, meeting in Rio de Janeiro, urges scientists to take the lead in exploring solutions to the world’s grand challenges. (pages 32-33): The TWAS Steering Committee in 2013 met at the Accademia dei Lincei, in Rome, Italy, on 5 February. (pages 34-35): Brief news about honours, appointments, awards and events.